So you want to get started in Fashion Illustration? It looks pretty simple, you think you can do it, but you don’t know where to start? I’ve been doing this and learning a lot. 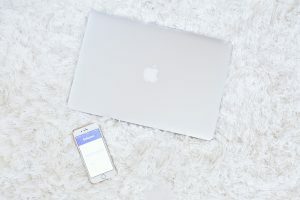 So let’s discuss the five top tricks that have helped me out and can help get you ahead of the game. You want to make sure your fashion figure pose isn’t stiff but has movement and flow. If you draw your fashion figure straight up and down it will come off as cold and robotic. 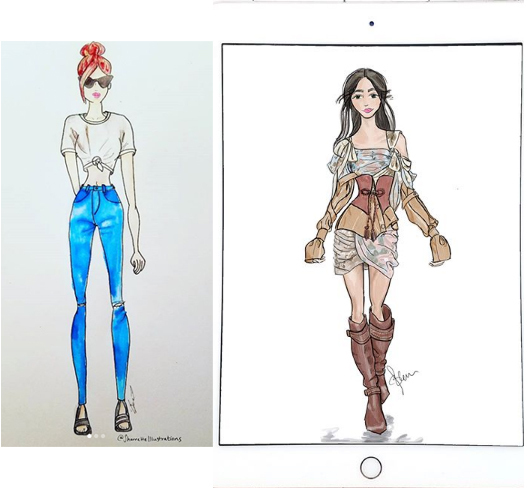 Here are some of my very first fashion illustrations. I’m kind of embarrassed to show you these, but everyone has a starting point. This was mine. As you can see, they look stiff and the one on the right-hand side even looks like she is falling over slightly. So how do you create movement? On to tip number 2. You want to create movement. Angles, the body sways as you walk so you want to emulate that in your fashion sketches. Study fashion photos and see how the models are posing. Here are a few to give you an idea. Follow the angles the model’s body makes and incorporate that into your drawings. Draw fashion illustrations of models walking the runway. The hips will go one way, while the shoulders go the other. I still have trouble getting this perfect, see my latest Instagram post for what I’m talking about. Having the correct materials can make your work 100 times easier. This one you can get away with not having the correct materials. However, I highly recommend investing in some good alcohol ink markers. The colors blend well when you are using them and create just the right blends you are wanting to create in clothing, hair, skin, etc. You can blend with watercolors and even the iPad pro. But, alcohol markers make it so easy! Personally, I switch between the iPad pro procreate app and hand-drawn fashion illustrations with Copic markers. I started out with colored pencils and watercolors and started investing in copic markers. It took me six months to invest in them to get a good variety. The difference is huge. Just scroll through my instagram feed and you can see what a difference the materials seems to make. 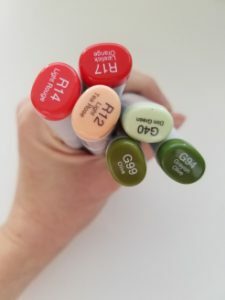 Copic Markers, or really any alcohol ink markers, are super easy to blend and use. You don’t have to get a degree to use them. You can layer the lighter colors to make a darker shade or add a slightly different tone to create the folds and shades of the outfit. Yes, you can do this with watercolors but I have found that the watercolors were not as easy as a beginner as the copic markers are. As with everything, you need to practice, practice, practice to get better. It still takes me several hours to complete a fashion illustration. You can do different practices to help your speed. I just haven’t invested the time in that yet. Since it takes me several hours to complete one, I usually only manage to do about 2 to 3 fashion illustrations a week. I am wanting to be able to do them quicker so I can do more in a week. I am just not there yet. Studying other fashion illustrators’ works and components has been a huge help for me. 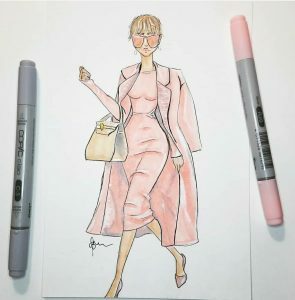 Check out my post on my favorite fashion illustrators to follow on Instagram. I study different elements or features that they have in their drawings that I love most and try to recreate them in my own figures and fashion illustrations. Occasionally, the artists’ will even posts tips and tricks on what they do to create their illustrations. I always get excited to learn something new to help improve my work! When I first started drawing fashion illustrations, I had a lot of difficulties drawing the eyes and other facial features. It took practicing and studying what others did to improve. I still have a long way to go. In the beginning, I loved sunglasses or glasses because I just could not draw the eyes to save my life! There are a few places that you can take a quick fashion illustration class. Check out skillshare, youtube, or as I mentioned in tip number 5, Instagram stories. You never know what tip or trick will help improve your work the most! 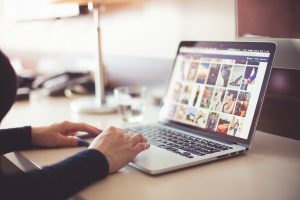 Also, don’t forget about pinterest as a huge resource. 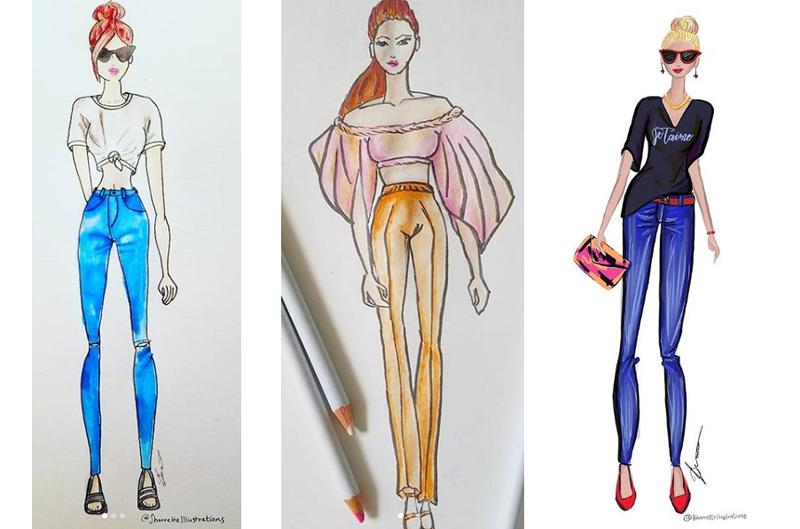 You can find fashion croquis to help you get started or different outfit ideas for incorporating into your fashion illustrations. These are my top tips for learning and perfecting fashion illustration. There are so many other tips and tricks you can utilize. I’d love to hear some of your tips that have helped you the most. Comment on this post or get in touch with me via social media! I look forward to interacting and learning with you! 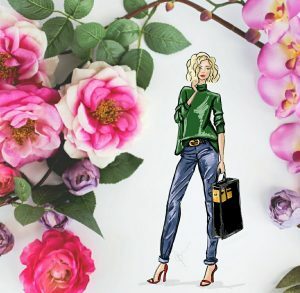 Instagram Artists to Follow – The Best Modern Calligraphy and Fashion Illustration Artists that You won’t want to miss and how to find more. Instagram has definitely stepped up Its game, too, with helping you find amazing artists to follow through the following of specific hashtags instead of having to search and then peruse them. Now new posts I wouldn’t normally see are right in my feed! I can like and follow the artist. I can see if their post is the subject of their Instagram or if it was a one-off thing. I have added countless amazing artists to follow through that ability. To save you some time going through those hashtags though, here are my top 5 modern calligraphy and watercolor artists to follow, as well as my top 5 fashion illustration artists to follow on Instagram. Her watercolor pieces are just adorable! You are sure to fall in love with her technique and adorable paintings. She tends to paint cute vintage items. I haven’t seen something of hers that I don’t like! Her layout design is excellent. She has nice clean lettering and it is always eye-catching. She hasn’t been posting a lot lately, but I definitely recommend following her for when she starts posting again. Super cute style and she does a variety of layouts, colors, and designs. Her work is vibrant and just so streamlined. She manages to make her work appear like perfection in every post. Her work is absolutely stunning. Okay, so she isn’t a calligraphy artist but I couldn’t leave her off my top 5 list. Her focus is watercolor art. Definitely, check out her work. You won’t be disappointed! How can I forget her magnificent work? I love her lettering style! It’s so unique and quirky. The colors she uses are always brilliant and creative. She seems to do it all from normal watercolor lettering to using ink and nib. She is my favorite fashion illustrator. She does a lot of stories with great tips for what materials to use to draw your own fashion illustrations. She also had such a cute style! She is the first I click on anytime I log in to my feed. Her main medium is watercolor. Can you tell I love how watercolor looks? She always has a variety of subject matter in her pieces. One of my favorites is a mom doing yoga while laundry and her children wait for her. Zen in a busy life! Check out some of her other pieces to be inspired! Her focus is comic art and using black and white ink. Her work is super fun and light-hearted. Definitely, a must to follow if you love all things girly, everyday life, and comics mixed together. When I first started doing fashion illustrations, I looked at her drawings a lot. I love the way she does the facial features, especially the eyes and freckles! I’ve tried doing freckles a couple of times but they never come out quite right. Probably because I do full body shots and she does more upper body drawings. Either way, her work is fabulous! Fashion Illustrator and Artist. Her work is sophisticated and lifelike. Beautiful portraits of all different types of women and fashion. The colors she uses are vibrant and each piece has eye-catching details! Love her work! These are my top ten favorite artists to follow on Instagram. I love seeing the pieces they produce and secretly envy their talent. I try to emulate them in my pieces, but of course, nothing is ever as good as the original. Check them out and definitely follow them. You’ll enjoy the enrichment that they add to your stories and feed. Check out our shop to order prints, digital downloads and more, or contact us to get started on your custom graphics or illustration today!